Issue #206 • May 11, 2015•Buy Now! Confined to the still boat of his bedroom mattress, Albert Bursk hears the solid porcelain clunk of dish on dish coming from their kitchen and wonders what she will shove at him today. He’s not pale like you’d think. Instead his eyes and skin are going gold like a trophy —1st Place for “He-Who-Sleeps-the-Most-and-Refuses-to-Make-His-Wife-Feel-Unappreciated-by-Saying-I’m-Sick-and-I-Have-No-Appetite-Left.” Like it or not, she makes him eat, his whole right side in mutiny and bedsores. A pain like someone stuffed an umbrella up his rump and now they’re trying to open it. His bones work against him. This is a man who jogged, drank little, never smoked a cigarette in his life, and walked how many stairwells, a million steps through countless kitchens, propping restaurants up on their faulty feet. All this while the back-of-the-house sucked down Heinekens swiped from the walk-in cooler, while the line cooks puffed like smokehouses out back by the dumpster. They stay up for days, and work double-shifts on the end of a cocaine bender. Those suicidal bastards will live forever. But not Bursk. Scott Cheshire is the author of the novel High as the Horses’ Bridles. His work has been published in AGNI, Electric Literature, Guernica, Harper’s, Slice, and Picador’s anthology The Book of Men. He lives in Los Angeles. HT: What was the seed of this story? What was the first thing you wrote? SC: Most of my writing is rooted in a question I find compelling, some idea I can’t quite shake, and the more unanswerable that question the better. In this case, I read an article by a hospice worker who happened to mention what a complicated relationship there is between food and the fatally ill. How food quite literally represents “life” for us all, and so, predictably, the closer one comes to death, the less one desires food. And yet food is often exactly how a concerned family shows its love. This seemed to me a profound irony. And because I worked in restaurants for years, as a waiter, and as a bartender, and because I love food (I do all the cooking in my home), I wondered what that loss might be like for a man who’d spent his whole life around food. Food was all. I also wanted to write my version of a love story. And so I put the poor man in bed, exhausted, dying, and dreading what the love of his life might be cooking for him in the kitchen. I wrote the first paragraph, pretty much just as it is. It has changed, but very little. And this became Albert’s voice. HT: What was the most challenging aspect of writing this story? SC: I would say trying to believably straddle comedy and tragedy. I imagined Albert as one of those men I knew in my youth, like my father and his friends who would gather around the grill in our backyard, and talk and shout and eat and gossip with so much enthusiasm, so much life. Their faces would go red, making each other laugh, as they told and retold the same ridiculous stories, calling each out on earlier versions that belied the one they just shared. All very old school. I imagined a man like this cut down, at way too young an age. I figured Albert would be bursting with life, even while he was dying. In fact, this is where his name came from—“burst” became Bursk. So I wanted a tone that allowed for laughs, but one that also let Albert be sincere, loving, and possibly, hopefully, strike sad chords within the reader. Not to mention I’m naturally drawn to playing with structure and perspective, so that’s always a challenge for me. Pushing the envelope, but also making it work. HT: This story is about a man’s last meal, and also, a kind of reckoning. Can you talk a bit about the connection between food and memory, and how you used it wind your way through Bursk’s life? SC: I’m drawn to stories that unapologetically face the fact that all of life is spent inside the mind. Yes, we walk through the world, and we fall in love, and we play sports, and we knock on doors, etc., but all of that is mediated by consciousness. I love books that attempt to marry the exterior and interior experience. I try to do the same in my own work. And food is a hell of a bridge. When I smell fresh curry I’m helplessly thrown thirty years back (I grew up in an Indian neighborhood in Queens, NYC) to my twelve-year-old self. I see faces and places I’ve completely forgotten. I leave my body. When I smell fresh New York bagels, I swear I can see my grandmother, who’s been gone for years. It works the same for Albert. On a technical level, food as a trigger for memory is sort of perfect. It’s particular and tied to real experience, and yet it’s sort of ghostly, and exists only in the senses, and so it allows him to travel about in memory, which of course lets the writing go anywhere I want it to. Plus I got to write about toast. I love toast. HT: Like most writers, you’ve worked in a restaurant before. Did that experience help you write this story? SC: It definitely helped, if for no other reason than I got to briefly write about those deathless pirates that work in a busy kitchen. Line cooks are by far the most dangerous and devoted people I have ever met. I love them. 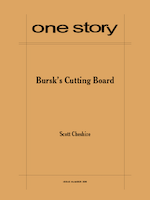 HT: One of the hardest things for Bursk to deal with is the jealousy he feels about his wife Shelly, as well as regret for his own near-dalliances. Do you see this story as a kind of confession? SC: Yes! And I’m so happy to have you describe it this way. There is the obvious deathbed confession trope, but for me all of writing is confessional, in one way or another, even if it’s done inversely. If a writer writes about things that do not in fact matter to them, that do not feel pressing, personal, or real, this too is a confession of sorts. A rather sad one. But the best writing, as far as I’m concerned, is always some veiled admission of obsession to the reader. Frankly, it was a bit of a relief to let a character do it so openly, for once. HT: The concept of zaghghat (forced feeding) winds throughout the story, from goose liver pâté to Shelley’s spoonfuls of mashed potatoes. Something that should bring joy and sustenance becomes instead distasteful. How does this relate to Bursk’s own life? And what do you think he realizes, in the end? SC: Sometimes when you’re writing the universe seems to respond, and it feels like you are directly in dialog with what Emerson called the “Over-Soul.” You ask, and the great world answers. Or maybe I’m just a sucker for that kind of mumbo jumbo. Either way, when I realized that essentially I was writing a story about force-feeding, it only made sense that Albert had a problematic relationship to foie gras; and when I realized that zaghghat was the original and Egyptian term for force-feeding, and that that word sounded uncomfortably like a certain diner’s guide—well, it was like a great gift, a deeply embedded pun had been revealed. Or maybe it’s just me. As far as Albert, I think he comes to accept love, utterly. Which means he forgives himself. He eats up life to the end. HT: If you had the chance to choose your last meal (and could still enjoy eating it) what would it be? SC: This is such a good question, as it’s just the sort of question you ask yourself or you ask your friends but never take it quite seriously. And so here is my answer, for posterity—it would be breakfast: a pot of hot coffee, fresh cream, and a lightly toasted sesame New York bagel, with a thin schmear of cream cheese, a generous portion of smoked sable, a tomato slice, red onion, and capers. The Sunday paper. A breeze. HT: How long did it take you to complete this story? SC: On and off, it took about a year. Short stories are not especially cost effective endeavors. But how I love to read and write them. HT: What are you working on now? SC: I’m halfway through a new novel. It’s sort of an inside-out thriller, “a literary thriller,” if you like that better. I’m also working on a short story, based on one I used to think was the best thing I’d ever done, until I realized it was actually incoherent, often terrible, and forty pages long, which officially made it not short. I liked the last paragraph, though, and so I made it the first of a brand new story. The rest went in the trash. We’ll see what happens. HT: What is the best bit of advice about writing you have ever received?